The 2016 Kia Sorento is unlike any SUV placed on the market before it! This Sorento is designed to be sleek, strong, and dynamic. With the 2016 Sorento, you will get more cabin space with expertly crafted seating for ultimate comfort along with a first-class wraparound dashboard with intuitive technologies. Prepare yourself for an unparalleled driving experience like no other. Stop in to Carriage Kia today and see the 2016 Kia Sorento for yourself today. Whether you are looking for power, efficiency, or both, you are bound to find what you are looking for with the 2016 Kia Sorento’s three engine options. The efficient Kia Sorento L and LX operate on a 2.4L DOHC 16-valve I-4 engine generating 185 horsepower and achieving 178 lb-ft of torque. The L and LX models get an impressive 29 mpg highway and 22 mpg city*. The 2016 Kia Sorento LX V6, EX V6, SX V6 and Limited V6 have the most powerful engine, running on a 3.3L DOHC 24-valve V6 engine, reaching up to 290 horsepower and generating 252 lb-ft of torque. The V6 models can reach up to 26 mpg highway and 18 mpg city*. The 2016 Kia Sorento EX and Limited trim levels get the best of both worlds with a 2.0L DOHC 16-valve I-4 turbocharged engine generating 240 horsepower and 260 lb-ft of torque and attaining 27 mpg highway and 20 mpg city*. We told you that you had options. There is a 2016 Kia Sorento for every lifestyle. The 2016 Kia Sorento has been completely redesigned. The eye-catching exterior is sleeker and more sculpted than ever before. The wider stance and longer wheelbase allows for an increase in cabin space and now has available seating for up to seven. Some of the luxurious standard features include: body-color heated outside mirrors with LED turn signal indicators, solar controlled privacy glass, heated rear glass with timer, projector beam headlights, LED light bar positioning lights, a rear spoiler, a locking fuel filler door, and an oval exhaust finisher. More advanced features can include smart welcome lighting and a panoramic sunroof with a power sunshade. 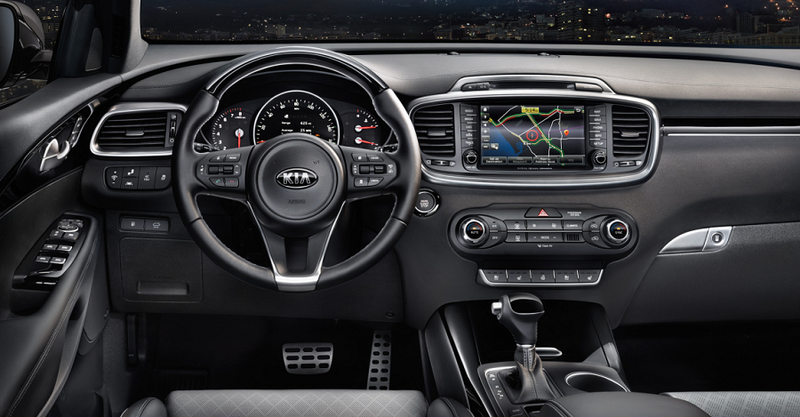 The interior of the 2016 Kia Sorento has all the features that deliver maximum comfort. The 2016 Sorento comes with more cabin space and improved seating for passengers. Some of our favorite standard entertainment features include: an AM/FM/CD/MP3/SiriusXM audio system, Bluetooth® Wireless Technology Hands-Free Connectivity, steering wheel-mounted audio, hands-free phone, and cruise control buttons, a USB/auxiliary input jack so you can connect your music from your iPhone or other compatible devices. While you are enjoying your drive with your favorite songs playing, enjoy some of the best convenience features in comfort, including: a trip computer, an EcoMinder® Fuel-Efficiency Indicator, drive-mode select, power windows with driver one-touch auto-up/down, power door locks with speed sensing lock and impact sensing unlock, remote keyless entry, under-rear-cargo-floor storage compartment, and cloth seats with YES Essentials® Fabric Treatment. On higher trim levels you can experience features such as: UVO eServices Infotainment System, Infinity Surround Sound Audio System with Clari-Fi™ (with ten speakers, external amplifier and subwoofer, and HD Radio™), and heated/ventilated leather seats. The 2016 Sorento takes affordable to a luxurious level! Some of the standard safety features on the 2016 Kia Sorento include: dual front advanced airbags, dual front seat-mounted side airbags, side curtain airbags, roll-over sensor, 3-point seat belts for all seating positions, front seat-belt pretensioners, 4-wheel disc brakes w/ Antilock Braking System (ABS), Vehicle Stability Movement (VSM), Electronic Stability Control (ESC), Traction Control System (TCS), Electronic Brake-force Distribution (EBD), Brake Assist System (BAS), Hill start Assist Control (HAC), Tire-Pressure Monitoring System (TPMS), side-impact door beams, front and rear crumple zones, Lower Anchors and Tethers for CHildren (LATCH), and rear child-safety door locks. Be sure to stop into Carriage Kia and experience luxury in a 2016 Kia Sorento today! With our large inventory, our team here at Carriage Kia loves helping our customers find the perfect new car or used car for them! Please feel free to contact us if you have any questions or would like to schedule a test drive! Watch actor Pierce Brosnan, aka James Bond, in Kia’s 2015 Super Bowl ad! Brosnan goes to a talent agency for a role, he believes, to be another action film. What it really is, is a 2016 Kia Sorento commercial. The 290 horsepower, all-wheel drive 2016 Kia Sorento is the perfect get-a-way vehicle! Check out its off-road capabilities with Pierce Brosnan behind the wheel. Even Brosnan is blown away by the 2016 Sorento’s performance capabilites! Keep things exciting in an all-new 2016 Kia Sorento from Carriage Kia! Watch tennis pro, Rafael Nadal, join the extraordinary superhero team of X-Men! Nadal becomes the latest mutant force to join the league of X-Men swinging his cannon of a tennis racket and driving into battle in the 2016 Kia Sorento X-Car. This 2016 Sorento is complete with Wolverines claws, deeply dug into the front and back. Check out this awesome ad and be sure to see X-Men Age of Apocalypse and the 2015 Australian Open!